​There are many practical uses for pH monitoring in everyday life, such as measuring the pH of a swimming pool, or that of food, or the pH of a soil for gardening. As a result, there are a few different types of pH meter that cater to the different types of substrates that can be tested, and it is always best to get pH meters that are specifically designed for the hydroponics horticulturalist. There are two main types of pH meter used ​for hydroponics, the more professional meters that are always on and reading pH continuously, sometimes sending that information directly back to a computer, and then there are the portable hand-held 'pen'-type meters. Pen-type pH meters are significantly less expensive than the 'always-on' counterparts and so they are often the preferred option amongst amateur gardeners. ​Remember that pH is affected by temperature. Therefore, two identical solutions with different temperatures will each have a slightly different pH. This means that if your pH meter was calibrated with solutions of one temperature and then you used you pH meter to measure the pH of a nutrient solution of a different temperature, then the pH readout will likely be inaccurate. One way to get around this discrepancy would be to make sure that your nutrient solution being measured was always at the same temperature as the solutions that were used to calibrate the pH meter. Of course, in practice this would be difficult or even impossible to do efficiently. Fortunately, most pH meter manufacturers (but not all - see table below!) have incorporated an Automatic Temperature Compensation (ATC) feature into their devices. This means that you don't have to worry about temperature when measuring pH with an ATC-featured pH meter, as it will also take the temperature of the solution being measured and automatically compensate for any temperature differences to give you a final accurate pH reading. ​You are going to be dipping your pH meter into solutions and waving it about a bit to dislodge any air bubbles whenever you take a pH reading. This means that your pH meter is going to be exposed to a lot of water splashes, and at some point, you are almost certainly going to accidentally drop your pH meter into the solution being measured. Most manufacturers take this into account and have made their pH meters waterproof or at least water-resistant with a tendency to float so that the water-phobic electronics inside the meter are kept out of harm's way. Obviously a (more expensive) waterproof meter is the preferred choice here, however, a water-resistant pH meter that floats is also a perfectly acceptable option especially since getting a replacement, in the unlikely event it is damaged, is much more affordable. ​All pH meters need to be calibrated regularly and, for the most accurate readings, they can often be calibrated against at least two calibration solutions of differing pH. There are two types of calibration mechanisms available in today's hydroponic pH meters, namely, digital calibration and analog calibration. Digital calibration involves simply pressing a button when the pH meter is in a calibration solution and the electronics take care of the rest to calibrate the meter against that solution. Analog calibration, on the other hand, requires the manual turning of a dial (usually with a flathead screwdriver) in order to calibrate the meter when it is exposed to a calibration solution. Obviously digital calibration is the better (and more expensive) option here but analog mechanisms are also perfectly acceptable. ​pH meters designed for hydroponics usually show at least 1 decimal point of resolution but more expensive models can go to two decimal points. Obviously the more accurate your pH meter reading, the more expensive the pH meter, but also the more you will be able to understand the subtle variations in optimal conditions for your plants' growth. However, it should be stressed that having two decimal points of accuracy on the pH meter is by no means necessary for successful hydroponics. ​One of the components that dissipates over time is the internal Potassium Chloride (KCl) solution found in most pH probes. More expensive probes that are usually used in scientific laboratories are designed to be refillable (with new KCl solution) and so extend their working lives. They are also usually of the 'double-junction' type which offers better protection to the internal silver electrodes. However, even expensive laboratory pH probes have a limited life span as the sliver electrodes and the junctions between chambers within the probe degrades with use, so scientific probes will last for several years but by no means indefinitely. For less expensive consumer pH meters like the 'pen'-type ones used in hydroponics, these have probes that are designed to last only 1-2 years since there is no mechanism to refill them with new KCl solution. In addition, the more they are used the faster they will expire as the internal KCl solution depletes slightly with each use. When one starts to get erroneous readings and other pH reading discrepancies, then it's time to change the probe. Fortunately, some manufacturers have developed pen-type pH meters for hydroponics with replaceable probes. However, all is not lost for pH meters without replaceable probes as their replacement cost is often much more affordable than their probe-replaceable counterparts. The PH-200 by HM Digital is one of the more expensive options out there for pen-type pH meters, but for the serious hydroponic gardener, it is well worth the extra cost knowing that you have something that is extra accurate and reliable. The PH-200 is waterproof, tested up to a rating of IP-67 (ie. it can be submerged in water up to 1m). It also comes with a clear cap so that the all-important electrodes can be monitored for wetness during storage. Like most pH meters, it has all the standard utilities like auto-off to conserve battery levels, a data-hold function that allows you to hold a pH reading if you can't immediately see the display (very useful for less accessible nutrient solutions), and a low-battery alert. The accuracy of the PH-200 is one of the highest available for pen-type pH meters providing a resolution of 0.01 pH ± 0.02 and it also conveniently provides a temperature reading at the same time. The pH electrode should last for approximately 2 years of normal use but a really nice feature of the PH-200 is that the electrode is user-replaceable - a feature rarely seen on pen-type pH meters. Although the unit comes with a sachet of storage solution, the amount provided is small and any regular user of the meter will need to purchase a separate bottle of the stuff in short order. 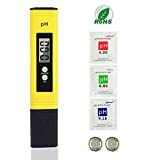 ​Overall, the PH-200 from HM Digital is an excellent all-round ​pH meter that is probably one of the best consumer pen-type pH meters that you can currently get for hydroponics. A warning on delivery: One should immediately check to see that the electrode is in moist conditions (ie the sponge is still wet) and not completely dry. If it is dry, there is a chance that the electrode has been damaged. The preferred course of action, in this case, is to return it immediately but if you are feeling brave, you can try to rehydrate it by leaving it in fresh storage solution for a day or two. It may be fine from that point on and work for its expected lifespan or it may fail earlier than planned due to the 'trauma' it would has suffered from drying out, so in effect you would be taking a risk. The only consolation, if it were to fail early, would be that a new replacement probe is available at a reasonable price. The BlueLab pH pen is another top-of-the-line pen-type pH meter sold by a reputable New Zealand-based company. For the price however, one would hope to have a replaceable electrode which it does not. Therefore, if it goes wrong and it is out of warranty, there is no economical way to replace it. The unit is waterproof and also has a backlit display which makes seeing your reading a doddle. The cap is difficult to get off, making it good at keeping the moisture in and preventing the electrode from drying out, but it also means that the fragile glass electrode inside is at greater risk of damage if you are too heavy-handed when removing and replacing the cap. In addition, the cap only fits correctly in one orientation but it is relatively easy to make the mistake of trying to close it in the wrong orientation which will break the glass electrode if pushed with any force. As with other pen-type pH meters, it has auto-off, a reading-hold function, and an indicator for when the battery is on its last legs. Unlike some other pH pens, it uses a single AAA battery for power, which tends to be more popular with users than the button cell batteries that most other pH meters use. Accuracy on the unit goes to 1 decimal place. 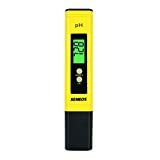 The Essentials pH meter is another popular pen-type pH meter, but without the reputation of other more established brands from HM Digital and BlueLab. This is partly because it is currently only available in the UK. Like other pH pens, it has auto-shut off, low battery warning, and it also has a backlit screen, ideal for taking readings under dense foliage. The unit is water-resistant, so one has to be careful not to submerge it too deeply in the solution being measured, but it will float if it is accidentally dropped in. Unlike other high-end pH pens, it does not display the temperature of the solution being measured, although the pH reading is automatically temperature compensated. Accuracy is a little lower compared to other higher end pH meters at ± 0.2 pH but for hydroponics, this is more than sufficient. The meter comes with a little calibration solution but you will certainly need to have your own separate supply on hand as with any other pH meter. Uniquely among higher end pH pens, the Essentials pH meter also comes with its own plastic carry-case to protect it when it's not in use - a nice touch. 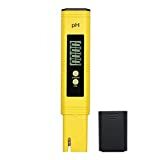 The ETI pH Pal Plus is a pH meter produced by the British company, Electronic Temperature Instruments (ETI) which makes a range of measuring equipment for both industry and the consumer. The ETI pH Pal Plus has a accuracy of ±0.2 pH, similar to other pen-type pH meters of its class. It uses 4 button cell batteries and has auto-off functionality that will turn itself off after 10 minutes of inactivity to preserve power. As with other pH meters in its category, it uses digital calibration at a single point of pH 7.0. It is water-resistant so can withstand water splashing on to it without the electronics being negatively affected but you would not want to submerge it in water. As with other pH meters, it has a hold function allowing for pH measurement without immediately observing the display. One critical oversight to the design of the ETI pH Pal Plus is the lack of automatic temperature compensation (ATC) on the pH meter, and although nutrient solutions can often be assumed to be close in temperature to that of calibrations solution (ie. room temperature), it is too liberal an assumption. Consequently, it is difficult to recommend the ETI pH Pal Plus pH meter, especially since other pH meters in its price class do include ATC as part of their designs.